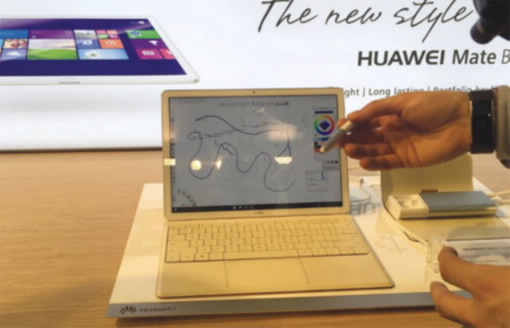 BARCELONA – Huawei has launched its MateBook during the Mobile World Congress 2016 in Barcelona which concluded Thursday. The MateBook will be available in the Saudi market after approximately two months and would have a starting price at around $700. According to Huawei Vice President of Middle East Region, Ashraf Fasakherji, the power concept and the accessories are some of the special features of the MateBook. “The plug in and the power concept are unique. You do not get it easily in other brands,” he added. He said one of the features that make the MateBook special is the device design. He explained one of the strong features of the device is the battery that is long lasting. The battery would provide enough power for around 10 hours. The device also features Huawei’s exclusive power-saving technology to meet the needs of business users. The MateBook operates with built-in Windows. Mate pen is another feature for the device which gives the user the ability to experience drawing and painting with real feel experience. The keyboard also is one of the advantages of this device since it has a 1.5mm keystroke and a chiclet keycap design. It helps in reducing the typing error. “We have a very high expectations for the MateBook and it’s a trend. We have to go with the trend,” Fawakherji said.